I’ve done some findings that helped me get the hybris startup time down to 40-50%. 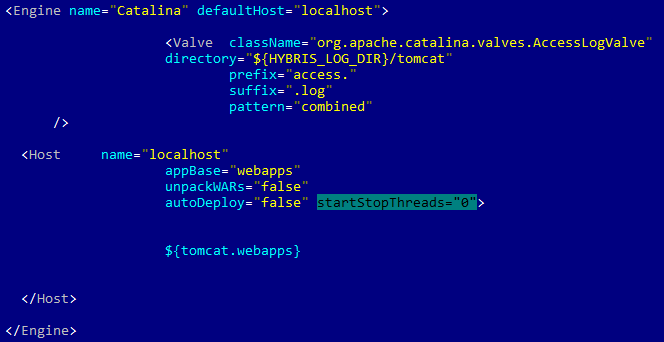 This article provides several recommendations on how to make hybris/Tomcat to start up faster. All pieces of advice below are only for the development environments because most of them have side effects important for the production system. See the configuration of my laptop below. However, take into account that hybris is not thread safe during start-up and many parallel processes may lead to unexpected behavior. Even if it works on local machine (e.g. QuadCore) it might not work on a production environment (e.g 12 or 24 cores). So delete this configuration if you face any problems. Also take into account that hybris will eat more cpu with this configuration. All changes explained before have already been applied to this installation. If you apply all these changes.. I guess that skipJars-related changes should speed up the server a bit more, but the “heavy project” configuration I played around before is no longer available for the tests. Anyway, another configuration shows that these changes work well. HDD: SSD SK hynix SC308 256 Gb 2.5″. MLC. – Read : 530 Mb/s. Up to 95000 IOPS. – Write: 380 Mb/s. 85000 IOPS. Operating system: Windows 10 Enterprise. I recommend this article on the Tomcat Wiki as well as the Tomcat system properties reference to understand these changes deeper. Nice article. On quick thing. Is backoffice working for you after adding the following config? I had an issue with hybris 5.7 in my dev profile with backoffice after this change. Agree with Shinu, after first initialization, “org.apache.catalina.startup.ContextConfig.jarsToSkip=*.jar” setting will make backoffice having errors. Storefront and hAC work fine.